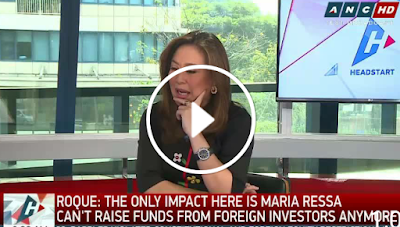 MUST WATCH: SPOX Harry Roque to Maria Ressa On Rappler: "It's all about money; it's not about press freedom." Di ba pwede ayusin nila qualification nila at sumunod sa batas tsaka sila humingi ng permit sa gobyerno to operate? Hindi yung magsisisigaw sila ng harassment when in fact they violated the constitution. Wala naman pumipigil mag pahayag sila, pero sumunod muna sila sa batas. Karen, kaw din maging fair ka minsan. Being intelligent former tongessman, and currently a political dogs of this administration - it is not impossible to twist things up for their benefit. Willie Torres: Press Freedom can not be made as an excuse to violate Philippine corporation law and the Constitution. Nor being a media outfit exempts you from the country’s laws. It is clear as daylight- 100% ownership of Mass Media Companies must be Filipino Citizens Period. Jarod Jay: You can't miss the overwhelming intention to mislead the audience by the way you state your questions which are actually statements to favor your premise of unfairness. And you are clueless as to why people who support this administration and it's goals to rid the nation of corruption hate your network? Jesus Tadeo: how come tgat they allowing mediaman to interview such guest but keep on showing her side in favor of rappler? is that the way if media now? you can ask question maybe but not confront your guest and tell what is your opinion about the issue? are you there to clarify things or make your ideas be heard and make it right? 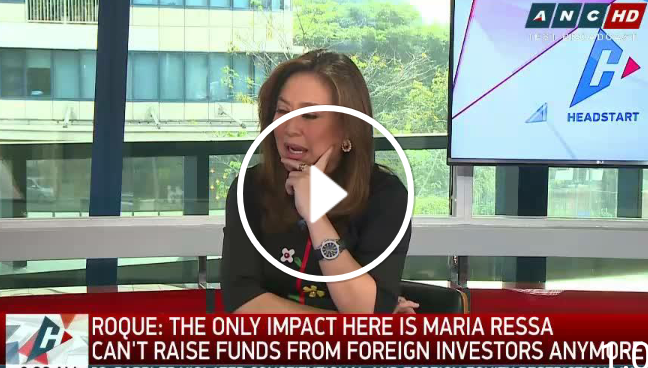 Cesar V Villaruz: Vintage davila interrupting Roque, trying to put words in his answers and asserting her one-sided mainstream media self-serving cause. 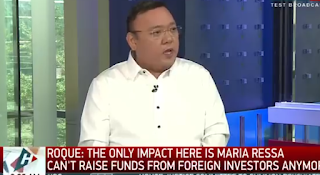 Imagine telling Roque at one point “let’s be honest.” Davila is a true disgrace to the journalism profession who belongs to the league of the looks of resssa. Ugly try. Trending Balita: MUST WATCH: SPOX Harry Roque to Maria Ressa On Rappler: "It's all about money; it's not about press freedom."